Creativity uncorked! Relax and let your inner artist flow in this welcoming setting. Complimentary wine & snacks provided. 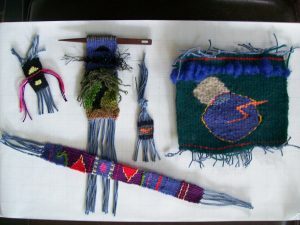 Tapestry is one of the simplest yet most versatile of weaving techniques. You will learn basic techniques on a miniature scale, using gem-like materials like embroidery floss and pearl cotton, with needle-weaving. 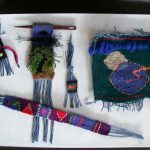 Applications could include jewelry, mini-wall hangings, ornaments, bookmarks — the techniques can be applied to any size or scale, frame looms, high or low warp traditional looms. The history of tapestry and many inspiring stories and resources will be included. $5 Materials fee paid to instructor at the class. $40/$35 MAC members. Class meets 4-6:30 PM. Online registration closes at 12 noon on Thurs., Oct.13. Call 304-258-2300 to register thereafter.